You will earn 17 Catt credits for buying this product. A collection of expert reports contributing an international approach to Special Educational Needs. Edited by Colin Brock and Rosarii Griffin, University of Oxford. Providing the appropriate educational opportunities for learners with special educational needs is a universal concern. It applies to all age groups and spans sectoral divisions such as between formal and non-formal, and public and private. 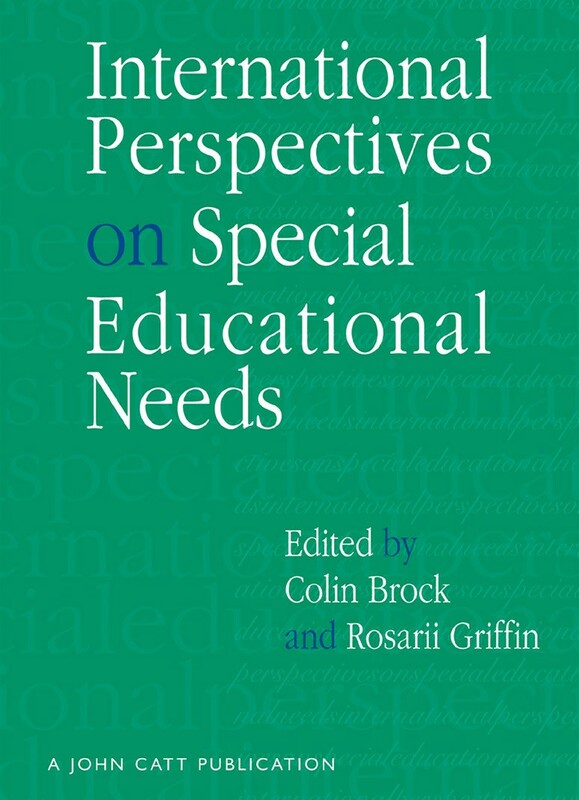 In this collection of chapters are assembled commentaries and discussions from a wide range of countries, though with some emphasis on cases from Europe and North America whence the main trends towards provision for learners with special educational needs have emerged. In general, we are concerned with policies and patterns rather than the technical discussion of particular forms of disadvantage and detailed pedagogical responses to the challenges they present. However, the chapters by Max Timmerman on ‘Original Powers of Expression’ and by Belle Wallace and Harvey B Adams on ‘The Enhancement of Cognitive Development in Disadvantaged Communities’ do have respective concerns with particular forms and approaches in terms of providing opportunities for expression and for learning. Even so, the messages from both are near universally relevant. The bulk of the chapters illustrate, in different ways and to different degrees, how policies and provision in respect of special educational needs are affected by the globalisation/localisation relationship. All are clearly on the move towards integration and inclusion, as promoted by the global discourse and increasing international interaction. This has been reinforced by the Salamanca Statement of 1994. At the national and local levels, different social and cultural contexts, informed by particular histories of political and educational development, make for diversity as well as different forms of inertia. The author(s): Edited by Colin Brock & Rosarii Griffin, University of Oxford. Contributors: Jennifer Evans, Institute of Education, London University; Robert Barratt, University of Oxford and Elisabeth Barratt Hacking, University of Bath; Edward J Casey, National Rehabilitation Board, Dublin; Christine O’Hanlon, University of Birmingham; Pilar Arnaiz, University of Murcia, Spain; Diana Tzokova, Brunel University, School of Education; Philip Garner, Nottingham Trent University; Max Timmerman, ABRONA, Institute for the Care of People with a Mental Handicap; Dale Goldhaber, University of Vermont, USA; Jeanne Goldhaber, University of Vermont, USA; Dan G Bachor, University of Victoria, Canada; Markus R Baer, University of Victoria, Canada; Gary Hornby, University of Hull, Madge Hall, University of the West Indies, Jamaica and Trinidad; Marva L Ribeiro, University of the West Indies, Jamaica and Trinidad; Dr María Báez, University of Newcastle-upon-Tyne; Dr Shimpei Takuma, Kawasaki University of Medical Welfare, Okayama, Japan; Toshiro Ochiai, National Institute of Special Education, Kanagawa, Japan; Tetsuya Munekata, National Institute of Special Education, Kanagawa, Japan; Dorothy Howie, Institute for Learning, University of Hull; Belle Wallace, University of Natal; and Harvey B Adams, University of Natal.